We present a selection of results produced in a project called Media Map. The project aims at developing an intuitive user interface to a library information system containing data on projects and publications. The user interface is a two-dimensional visual display created with the Self-Organizing Map algorithm. 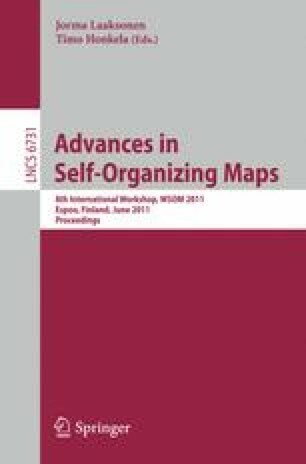 The map has been computed using the hierarchical self-organizing map, and a specific graphical design supports the visualization and use of the map interface. In the design, there are specific iconic representations for the projects, publications and persons displayed on the map. The novel aspects in this WEBSOM-type of document map are that the texts on the map are written in different languages, and there are different types of textual objects mapped on the same map. The interlingual mapping is based on applying machine translation on non-English documents. Even when the translation is not fully correct, the approach works well when large enough proportion of relevant terminology has become translated.